As expected and to the joy of many Arsenal supporters. one of the summer signings has been named the club's most outstanding player of the month of August. Matteo Guendouzi emerged winner of the Arsenal Player of the Month of August with sixty-eight percent (68%) of votes from the poll. 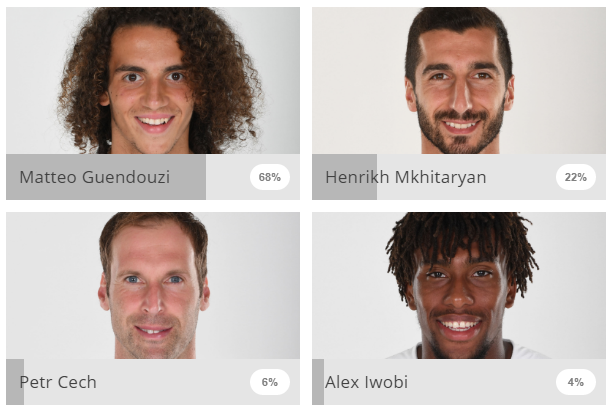 Henrikh Mhikitaryan and Petr Cech scooped second and third place respectively. The French youngster who we felt will be a player for the future has got himself a spot in the senior team with impressive displays in all four of Arsenal's Premier League games this season. The 19-year-old in just one month has been able to win himself a place in the heart of supporters who are still calling for the demotion of Granit Xhaka. After Nicolas Anelka, Cesc Fabregas and Johan Djorou, Guendouzi becomes the fourth teenager to start in all our first four league games. Guendouzi who has represented France up to the U20 level signed for Arsenal from Lorient in the most recent transfer window..